Home > Free Samples Australia > Free Books & Magazines > FREE Jamie Oliver Recipes!! Change your table menu with Jamie Oliver !! You will find many suggestions to COLOR your table with HEALTHY and DELICIOUS Recipes!! Hurry up! click go to offer! Make sure you subscribe to our newsletter for more free stuff. 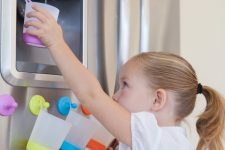 FREE Puj PhillUp Hangable Kids Cups! !